There were 4 guests: Adi signing up as a new BSC member; Amir here for the third time and has so impressed his wife, Aishah that she decided to check it out herself; Siti Hasnah who left Brunei at 16 years old, lived in several different countries and is now back for good. The theme for the evening is Childhood, cleverly concocted by TME TM Kelvin Lai. TTM Syatrah Roslan, SR2 invited all to rack their brains and ride down the memory lane. With a peaceful childhood and strict upbringing, TTE TM Philip Mooi urged us to pretend that he is not there so we could freely express ourselves. GRM TM Haryati Abd Gafur enjoyed an idyllic childhood and her WOTD is INVEIGLE (In-Vey-Guhl) which means to cleverly persuade or win/obtain something by clever talk. AHC TM Supatra Lee, born in Thailand and moved to Brunei at age 6, is adept at detecting words that unintentionally get slipped in that could impede or jeopardise the credibility of one’s speech. Growing up in Seria in a farm full of chickens and 20 dogs, T&T Lai Ling Ling, PM3 in her role as Timer now urges everyone to keep within time. GE Rahmat Tarsat, CC, as a kid has tried to console the sky when it was looking sad and heavy with rain. In her role as GE, she encourages all to give feedback to the speakers themselves. 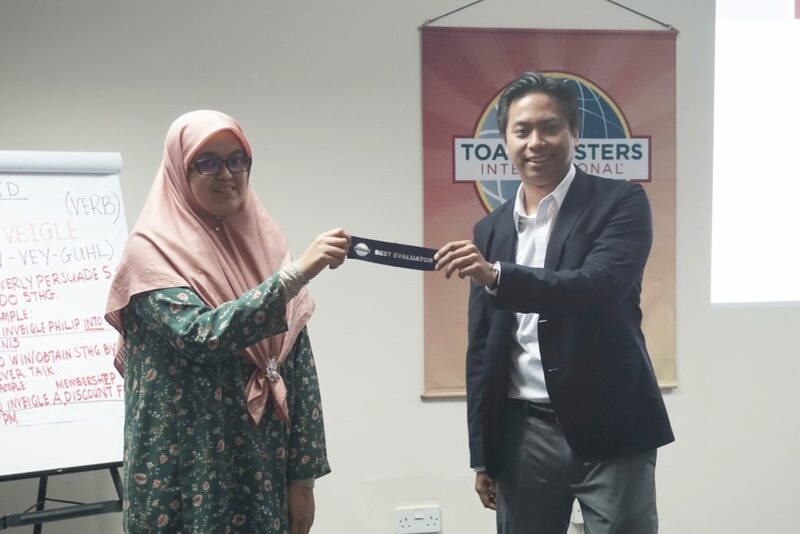 In her speech for Pathways Level 1 Project 2a on ‘No Pain, No Gain’, TM Ida Mahmud took us on a ‘surgical’ journey and how her mantra ‘Pain is temporary’ helped her overcome both physical and emotional pain. It was about how we can overcome pain and not let pain overcome us. 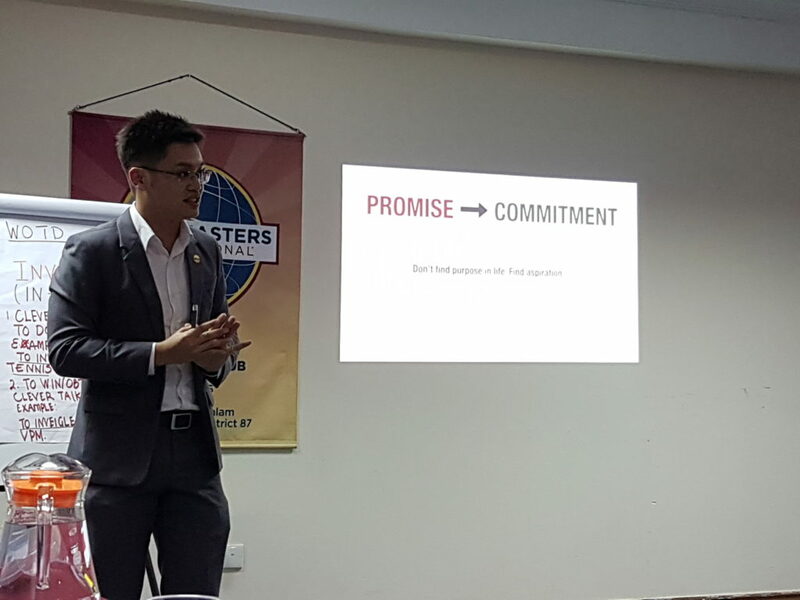 Allen Ang, DTM presented a workshop on ‘From Promise to Commitment’ where he explained that while it is easy to make promises, it is often harder to keep a commitment. He taught us some fullproof ways to make short term promises so they become more achievable and commitment will naturally follow. Examples were Aziman’s guilt-free ‘I will be home earlier’, Philip’s infinite ‘I will love you forever’ and Ling’s four-month achievable ‘I will get a boyfriend’ promise. • For TM Sharon Lim, many Chinese & English songs brought back childhood memories and even belted out a song by Britney Spears! • Amir, who is lucky enough to have thirteen siblings, still keeps in touch with his best friend and cousin Dino and recollected happy days playing marbles and flying kites. 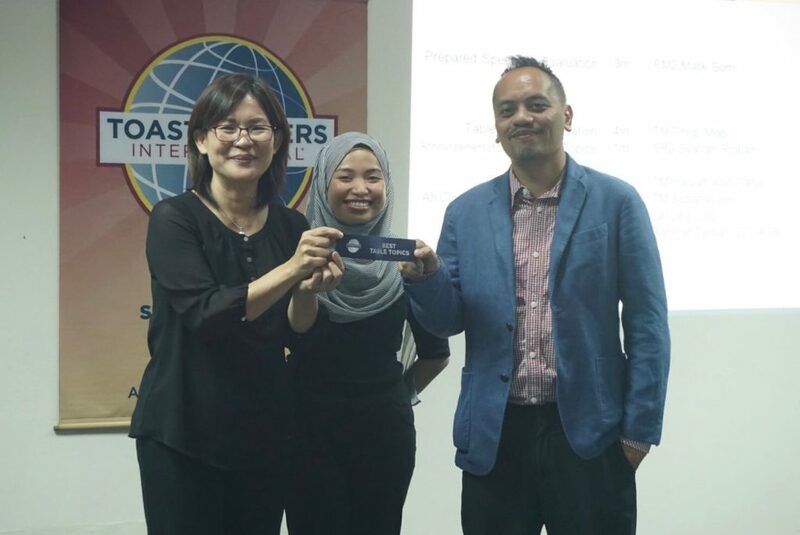 • It was a tie for that Table Topics ribbon by Rano Iskandar, ACB, ALB & TM Sophiana Chua in their respective anecdotes of a most embarrassing moment and a childhood item which was kept till now. For Rano, it was that car spoiler which stood between him and an admirer and for Sophiana, it was her prized marble which broke several other marbles and she did not ‘lose her marbles’ in the process. Pranika Lama, ACS, ALB, lent an expert hand to evaluate Ida’s speech after the evaluator proper could not make it. She managed to suss out areas for improvement for Ida, not easily detectable by the naked ear. Also at the eleventh hour, Philip gallantly took up the role as TTE and presented a succinct and encouraging evaluation for all the table topics speakers. The Best Evaluator ribbon went to Haryati in her GRM role where, amongst others, she pointed out that the WOTD was used only twice throughout the meeting, one correctly and one not quite. Rahmat commended on BSC’s camaraderie where there were many surprises leading up to the meeting and many members pulled their weight to ensure a smooth hiccup-free evening. a. Reminder about Appreciation & Installation dinner, Jerudong Starlodge at 7pm 8th Sept 2018.
b. Ling Ling tells us that some BSC members will be visiting Otters this week.